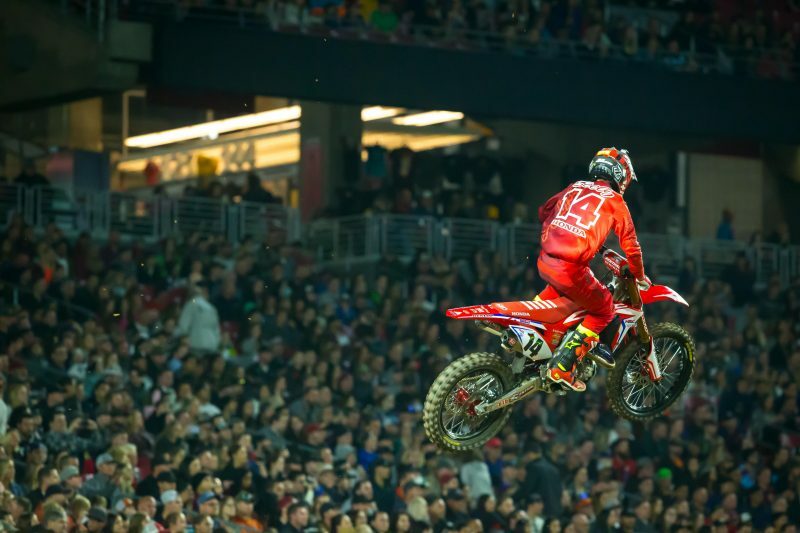 At round four of the AMA Supercross series, Team Honda HRC’s Cole Seely steadily improved throughout the day to ultimately secure fourth in the 450 main event, leaving him third in the championship point standings. 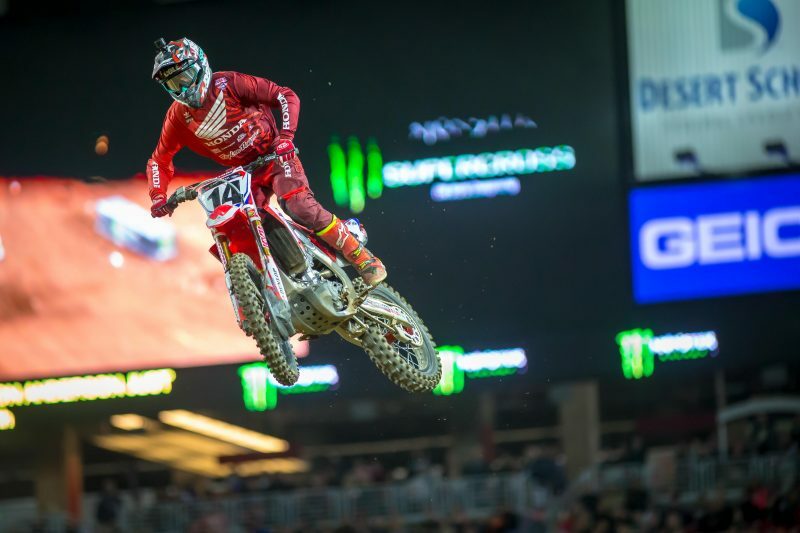 Teammate Ken Roczen remained sidelined, continuing to receive medical treatment for injuries sustained the previous weekend in Anaheim. 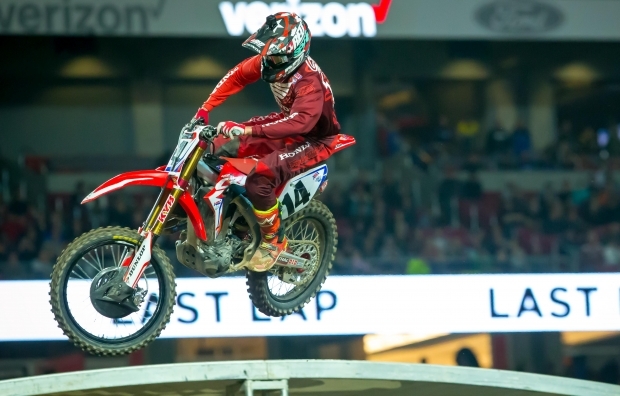 For the second consecutive weekend, Seely launched his CRF450R off the line to a solid third place start before moving into second on the opening lap. 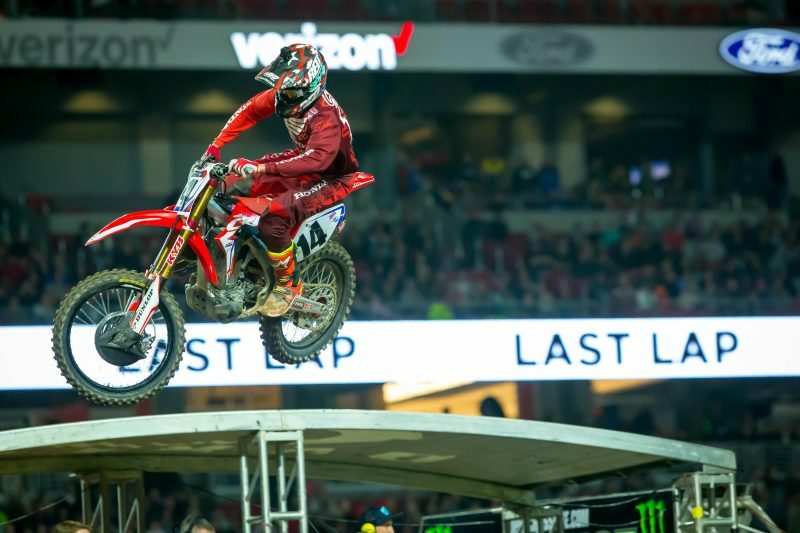 While the gap for the lead extended, the battle for second intensified and Seely narrowly slipped to fourth place where he held on to the finish. The Glendale track featured long straights and large, fast rhythm sections that saw lap times hovering around the minute mark. 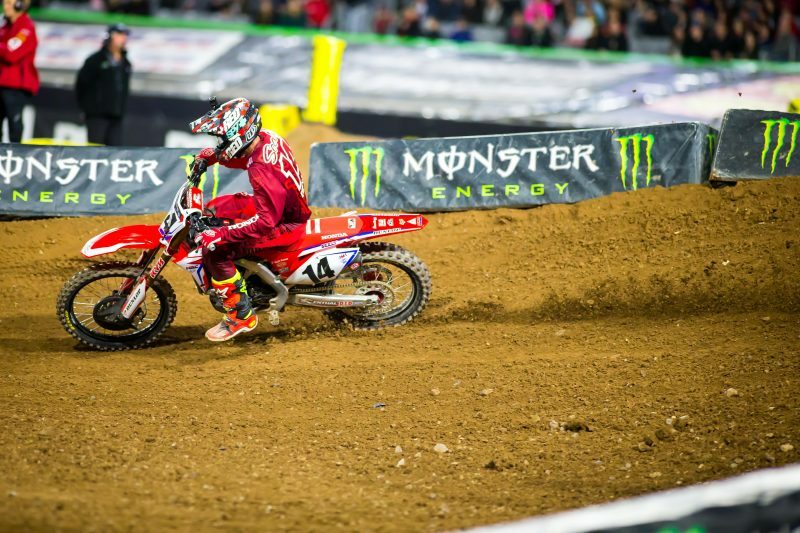 Seely laid down a time of 1:01.042 for 11th quickest during the daytime qualifying sessions. 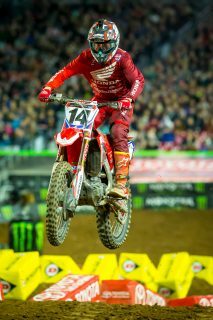 Slotted in the second heat race, Seely scored a sixth-place start. 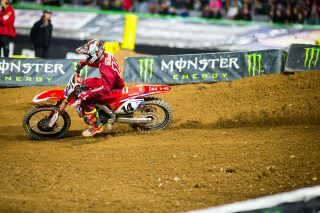 By the end of the six-lap race, Seely had moved up to fifth, forcing him to transfer through to the Semi. 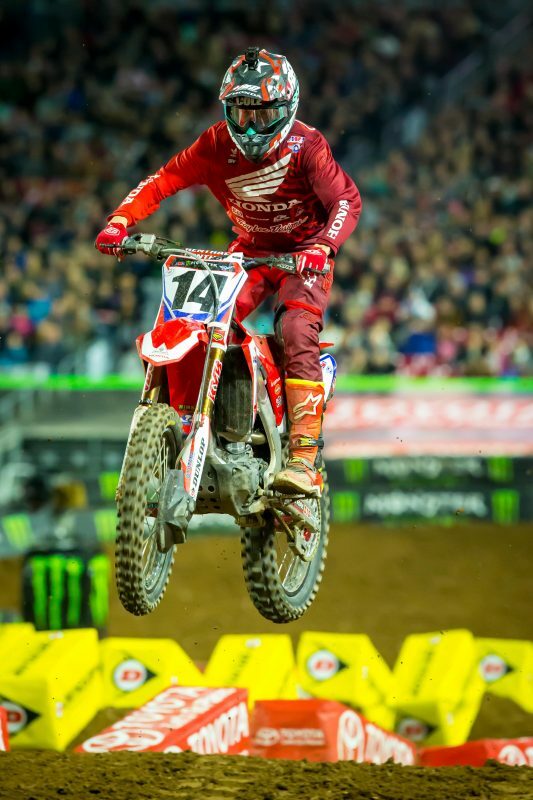 In the Semi, following a start that landed him in third position, Seely improved his pace, moving into second position that he held to the finish. It was a positive night for Smartop/MotoConcepts Honda Racing’s Justin Brayton as he secured his best finish of the season. 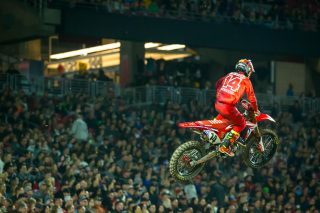 Off the start, Brayton asserted himself into second early in the race but quickly came under fire by the competition. He relinquished a few spots before crossing the finish line in sixth. 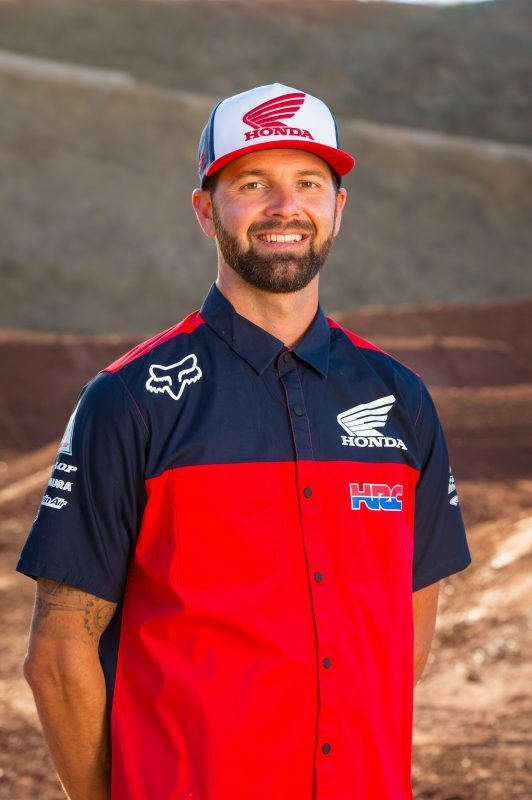 Team Honda HRC rider Ken Roczen continues to receive medical treatments at The Steadman Clinic in Vail, Colorado from injuries sustained at Anaheim 2. 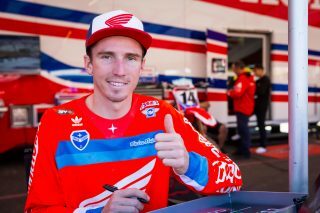 Roczen’s Honda CRF450R remained ready under the Honda awning and the outpouring of fan, team and industry support was high. 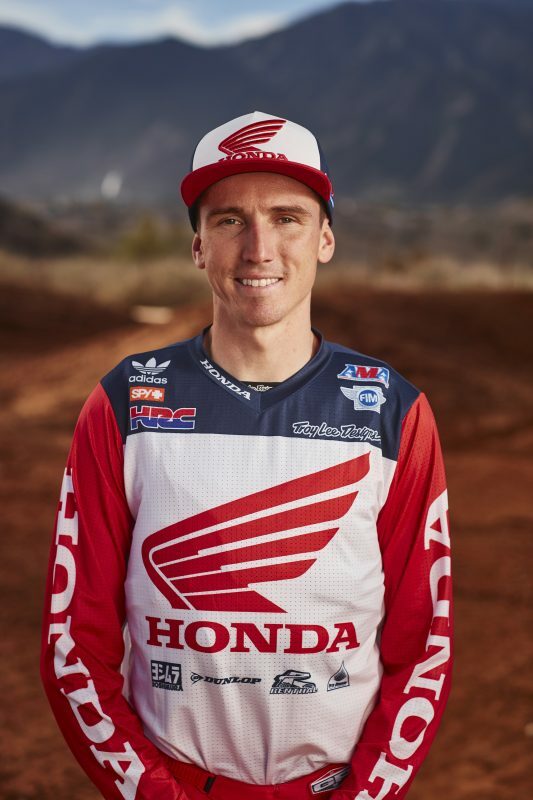 It will be a short week for Team Honda HRC, as Seely heads to Oakland, California early to take part in press activates. He will meet with regional media on Thursday before getting the opportunity to preview the track on Friday. A rider sustaining serious injury and a team being a rider down can easily shatter morale. However for Team Honda HRC, that is not the case as they continue to move forward as a united front. Support for both Seely and Roczen came from all reaches in Glendale. Crowds of fans visited the pits inquiring about Roczen while also getting autographs and wishing Seely luck. While the team had Roczen in their thoughts, the world-class race support for Seely was textbook. Throughout the day, the collaboration and support ranged from coaching and analysis, to mechanically and mentally assimilating to the track and ultimately providing encouragement for Seely to maintain a singular focus: winning. It wasn't in the cards for me tonight. The soil is super tricky here: sometimes I've ridden here and it's gone well and sometimes not. The line changed throughout the day and between the heat rounds and the main event I thought I had my lines picked out. But it changed and that changed my night. Mentally I feel like I'm stronger than I've ever been. The bottom line is that I want to win and we’ll see what happens in Oakland. Cole improved throughout the day, but line choices in the two big rhythm sections were where he was inconsistent and probably cost him his podium spot. Overall, there were some positives. He’s shown that he has the speed to run up front and if he is more consistent in decision-making and confident in himself he’ll get there. Heading into the main event we were all confident and he was confident. He got a great start but he didn’t pull the trigger on those rhythm lanes that gave him the speed he needed.